This year I felt well enough to visit the county fair not just once, but twice! Last year I was not able to attend at all, so I made sure to thoroughly enjoy myself this year! I watched my children having fun on the fair rides. I ate popcorn and cotton candy. I looked at all of the crafts and produce and 4-H fair entries. I visited the vendor tables and collected samples. I petted the goats. I had a wonderful time with my family! My parents were here in August, and they took the children and me to the fair one day while Will was at work. And then Will was able to go to the fair with us on the weekend. 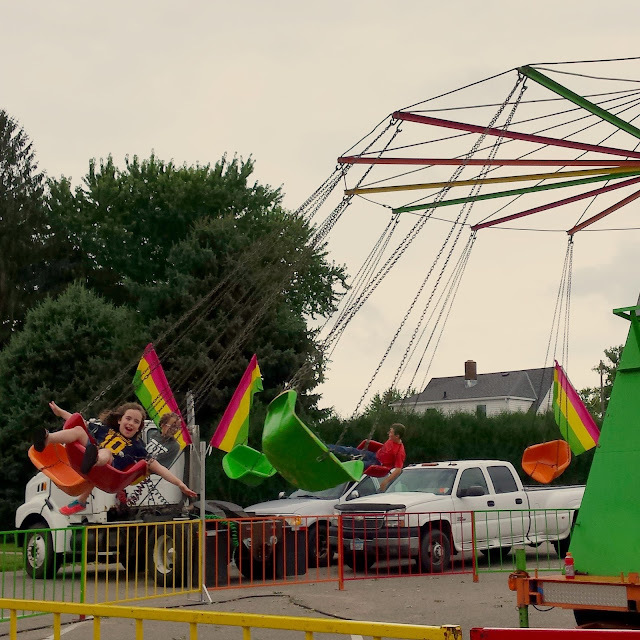 The county fair is one of my family's favorite events each year. We enjoy entering baked goods, garden produce, and crafts. 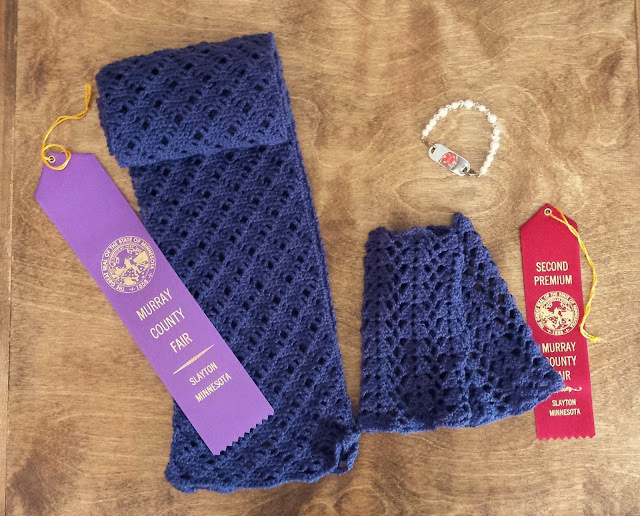 Throughout the year I work on crochet projects and jewelry to enter at the fair. Some years I am not able to go to the fair, but I always send along some items for entry. It was a bonus that I was able to both attend the fair and turn in craft projects this year! 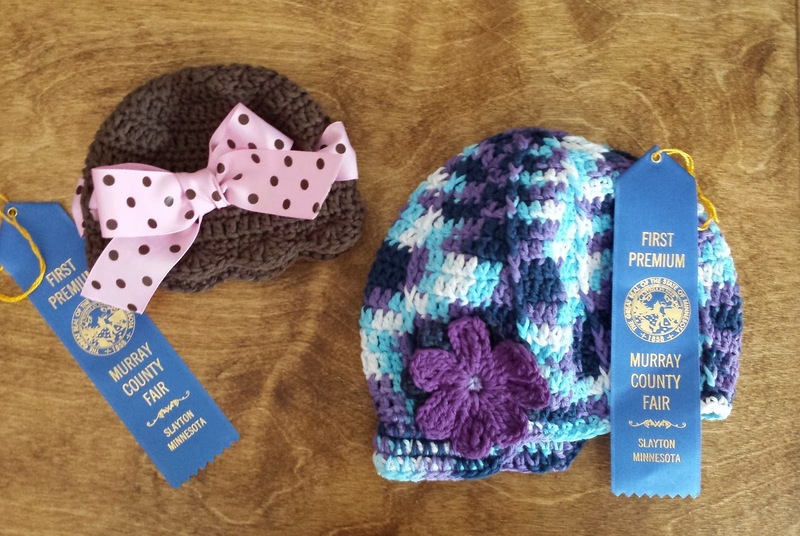 One of my goals this year was to win a purple ribbon for a crochet project. 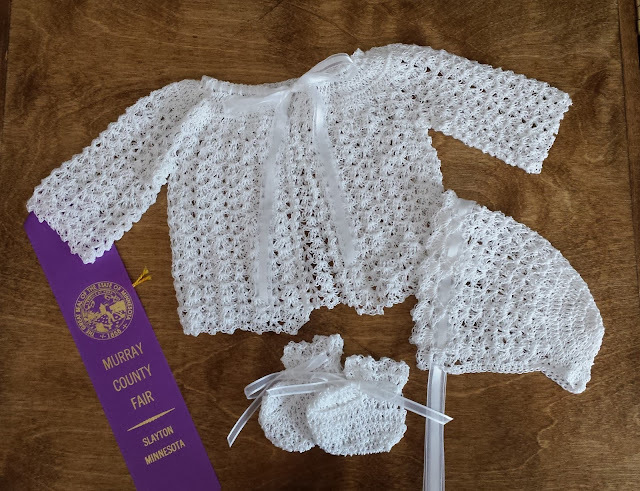 I have never won a purple ribbon for any of my crocheted items before, so I was thrilled when this infant sweater set received a purple ribbon! I used this free pattern. It's the same pattern I used when Adelaide was a baby. I never made the sweater for Adelaide, though, which I regret. I entered this baby hat (left) and newsgirl hat (right). I will use the baby hat as a gift for someone. The newsgirl hat is for Adelaide to wear this winter. She even picked out the yarn herself! I was super excited that my Bristleberry Scarf received a purple ribbon too! I made fingerless gloves out of the yarn remnant, and I will wear these gloves indoors this winter. My medical ID bracelet didn't receive a ribbon. Since we're talking about the fair and purple ribbons, I want to share Adelaide's exciting fair news! 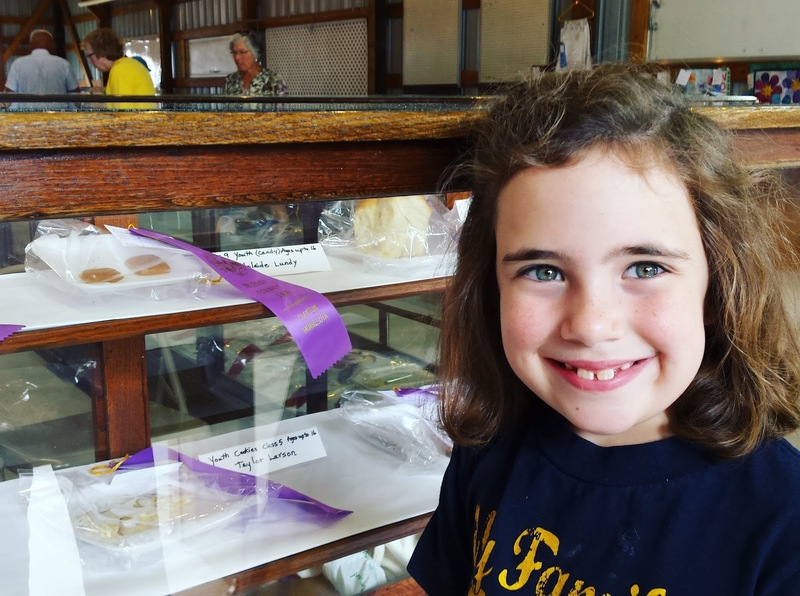 She had never won a purple ribbon at the county fair, and her goal for the fair this year was to win a purple ribbon. She succeeded! Adelaide won a purple ribbon for her caramel candy in the junior division. She was one happy baker! This fall I am keeping my hands busy by making a shawl. It is slow-going. I have messed up so many times that I have already taken out a total of 8 rows. Agh! Brain fog and crochet don't always mix well. I am also working on creating a little bag to hang on Myrtle. I'll show these to you when I have them finished. What have you been doing lately to keep your hands busy? Do you ever enter your projects at a fair? If not, you should! It is so much fun!